Can we talk about wiggle worms for a minute? As I’ve mentioned extensively on the blog, we’re homeschooling multiple children with ADHD, which means that wiggly kids are an everyday occurrence around here. 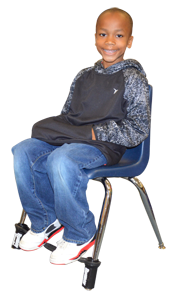 Using a simple fidget is a proven way to help kids with ADHD improve attention span and executive functioning. And, since attention span is important for successful homeschooling, fidgets are pretty much a necessity in our family. So I was thrilled to try Bouncy Bands! These inconspicuous fidgets are awesome for keeping kids attentive without attracting too much attention. Read on to learn more about this great product! Disclosure: I received this product in exchange for this post and I was compensated for my time. All opinions are my own and I was not required to post a positive review. 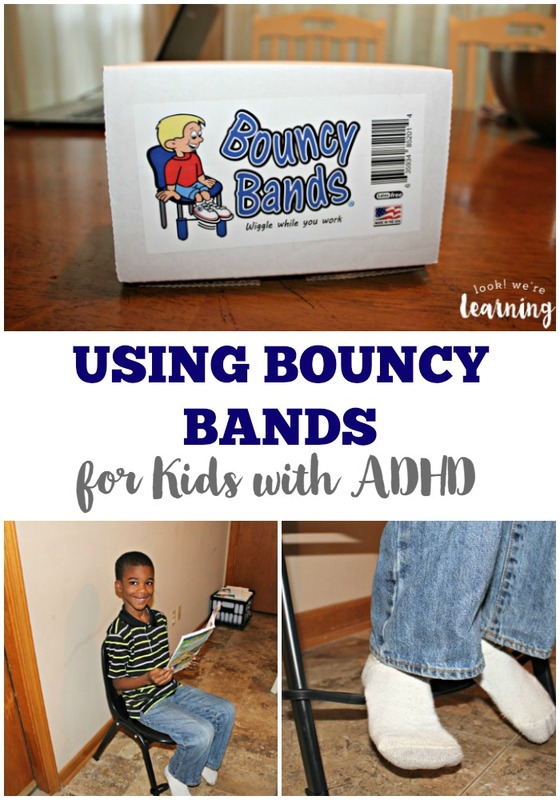 Bouncy Bands are simple resistance band fidgets for kids’ feet. 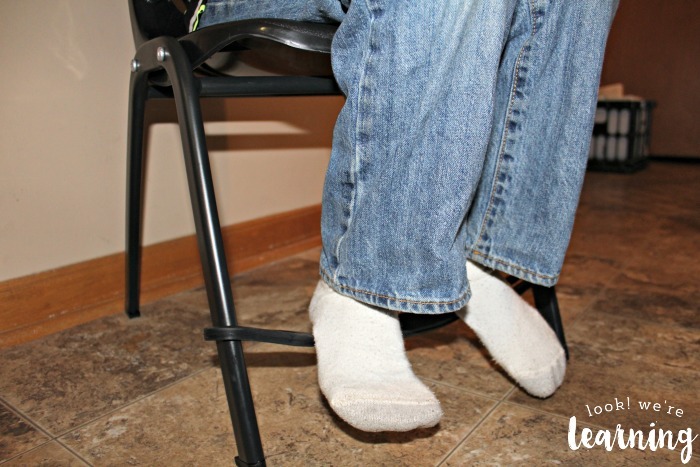 They’re designed to go around the legs of a desk or chair, so that kids can rest their feet on them and move them whenever they feel like it. 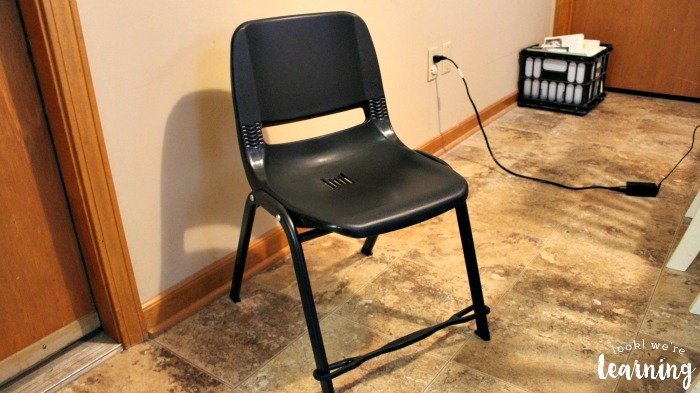 Here’s a look at the chair model. 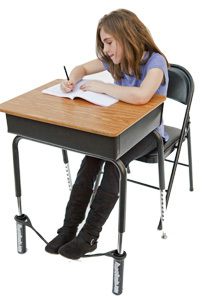 And the desk model – which is particularly good for older kids who might have longer legs. When you buy a set of Bouncy Bands, you can expect to receive a box like this. 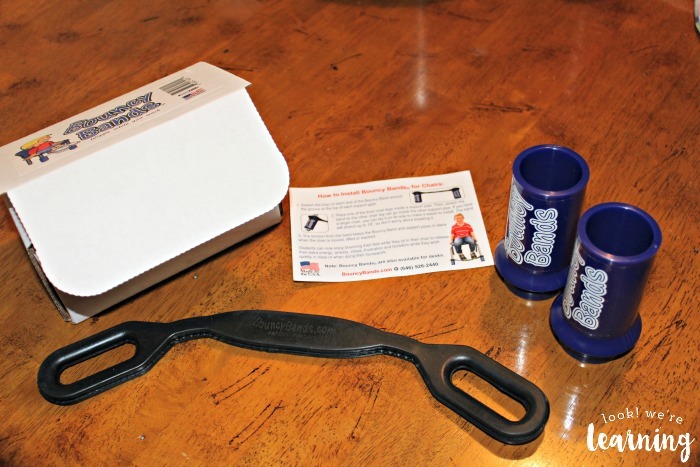 Inside are the band, the support pipes (which come in blue or black), and a simple instruction sheet. Assembly couldn’t be easier. Just wrap the band’s left and right holes around the tops of the support pipes. Done! However, here is the issue we faced: The band’s pipes wouldn’t fit around our dining room table legs. And the dining room is where we homeschool. Eureka! I just removed the support pipes and the band fit just fine. BTW, if you want to get a chair that these pipes are sure to work with, try this model. If you want to try the desk version, this school desk should do the trick. Our seven-year-old is, by far, the most active of our kids. He’s basically in constant motion. So he was the best tester in our family for Bouncy Bands. I had him sit in a chair and read a book while using the band as a fidget. Guess what? I thought he would bounce his legs like a maniac and get even more worked up. But he didn’t. He just bounced them occasionally – very gently – and kept his eyes on his book. I was thoroughly impressed. 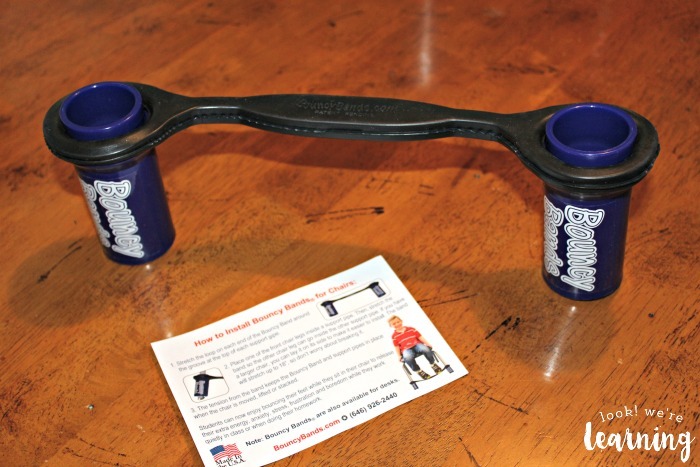 Want to see Bouncy Bands in action? Check out my video review from my YouTube channel! 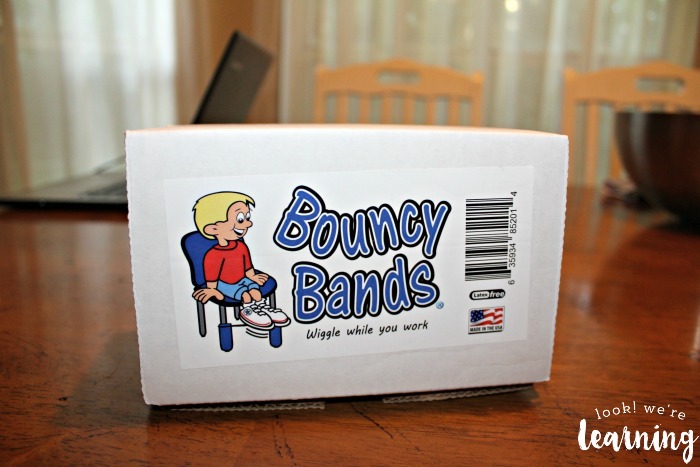 To learn more about Bouncy Bands, visit the product website for details about assembly and to read more reviews! Plus, keep up with Bouncy Bands on Twitter, Pinterest, and Facebook for more! 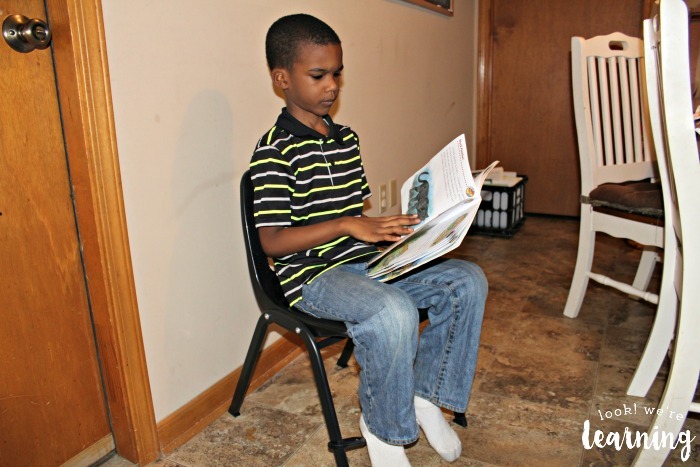 Need more tips for homeschooling kids with ADHD? Follow my ADHD Tips board on Pinterest! 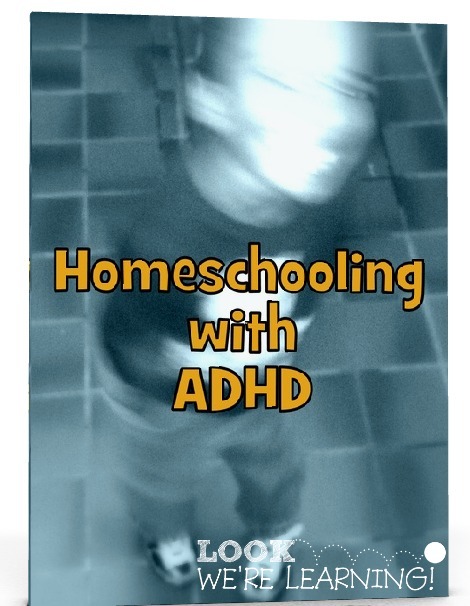 Don’t miss my Homeschooling with ADHD ebook! 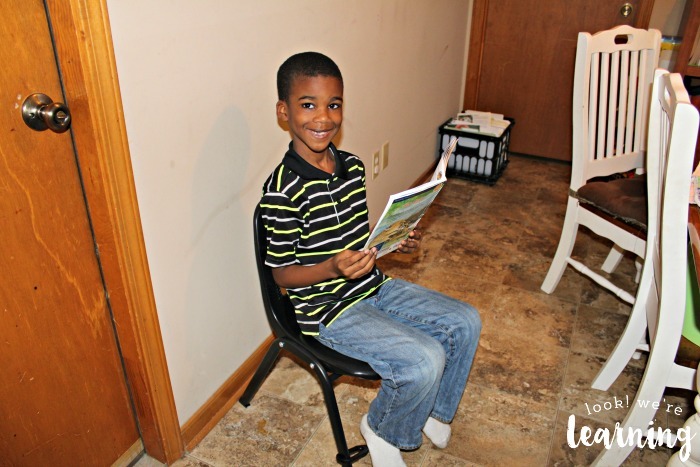 It’s packed with tips and suggestions to make this special homeschooling journey a success!